Classic car storage tipsDrive on which side ? The wonderful world of the Amphicar. Welcome to our web footed corner of the Interweb where we share information about the Amphicar and all things amphibious. The summer of 2017 means it's now 10 years since the serious flooding in the Worcestershire Gloucestershire area. Read about Flood Friday here. In March 2017 the not so steady-eddie in Florida put mechanical sympathy in it's box and did this. Certainly shows how strong and capable these fabulous little cars are. I had great fun recently with my "new best friend" James filming in Birmingham. Look out for the "future cars" feature that is part of his excellent "Cars of the People" TV show. I don't normally do TV or media stuff with Amphicar but made an exception for James because of his reputation. I'm glad I did, he is knowledgeable, courteous, respectful, considerate and hilariously funny, just, all round, a top bloke ! Other big news is Disney, anyone can now rock up at the Boathouse in Disney Orlando and buy a 20 minute Amphicar ride, that's good, share the fun and all that, but it does mean an interweb Amphicar search now returns boatloads of shakey short phone recordings of youths making that wierd horn sign with their fingers and say words like cool, awesome, radical and even sick. (I think "sick" might refer to the 1965 channel crossing.) Anyway, more about Disney here. 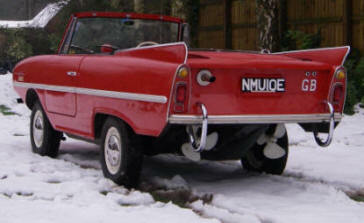 Totally new to Amphicars? Just go down the menus on the left - or read this great Amphicar article from the Petrolicious People. Want one ? Well first read why you don't in the for sale section.